When the Jewish Revolt broke out in 66 CE, the revolutionaries quickly captured the holy city of Jerusalem, thus assuring them access to the great Temple for religious purposes and to its vast treasury as well. 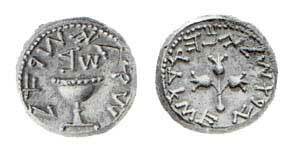 From the silver therein - presumably consisting of Tyrian coins paid in taxes over the years - they struck the most famous of all Jewish coins - in shekel and half shekel denominations. These handsome coins are the first truly Jewish silver coins. They feature a chalice on one side with the year of the revolt above, surrounded by the ancient Hebrew inscription “Shekel of Israel.” Three budding pomegranates are featured on the reverse, with the inscription “Jerusalem the Holy.” Two examples of prototype designs, with a row of dots encircling the symbols, are known. Prototype quarter shekels were also produced in the first and fourth years of the revolt. Unique in ancient numismatics, the edge of each shekel and half shekel was hammered, creating multiple flat facets (except for year 1 coins). Year 1 (66/67 CE) Jewish shekels and half shekels are scarce, year 2 (67/68 CE) shekels and half shekels and year 3 (68/69 CE) shekels and half shekels are relatively common, year 4 (69/70 CE) shekels and half shekels and year 5 (70 CE) shekels are extremely rare. Finally, there are three sizes of larger bronze coins, minted in the fourth year of the revolt, presumably when the supply of silver was running low. The smallest does not have a denomination indicated, but is usually referred to as an Eighth (Shekel?). It is assumed that all of these denominations are fractions of a shekel. Like the silver coins, a chalice is featured, along with symbols of the harvest festival of Succoth - lulav (bunch of branches) and etrog (lime-like fruit). The date and inscription “For the Redemption of Zion”" are inscribed. The medium bronze has the same inscriptions, with the denomination “Reva” (Quarter) indicated; a large etrog is depicted on the obverse, and two lulav are shown on the reverse. 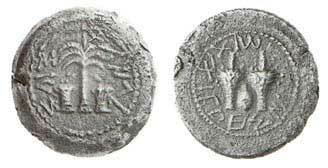 The largest bronze coins are inscribed “Chatzi” (Half); again the lulav and etrog are pictured on one side, with a palm tree and baskets on the reverse.